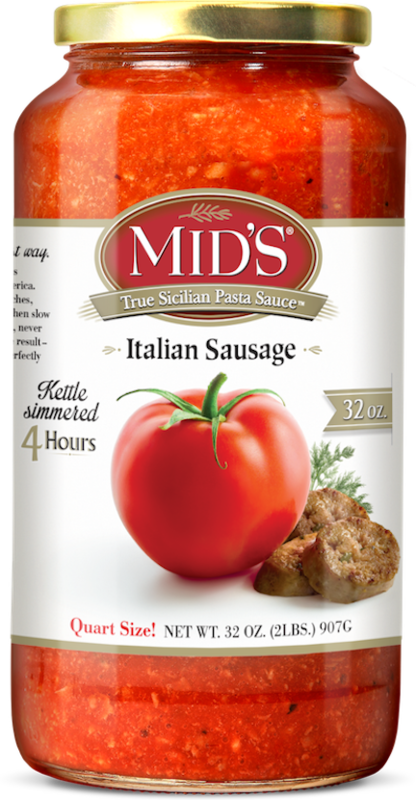 With a perfect combination of the freshest herbs, and Mideo’s secret blend of spices, our Italian Sausage sauce provides a kick that takes pastas and other dishes up a notch. Using the finest, locally raised USDA pork, our all-natural Italian Sausage sauce packs 6 grams of protein into every serving. This robust, wholesome, gluten-free sauce is comfort food at its finest. Recommended pastas include ziti, rigatoni, ravioli and angel hair. Try topping a plate of rice with Italian Sausage for a quick, zesty meal, or heat it up for a hearty bread dip. Ingredients: Water, Tomato Paste, Italian Sausage, (Ground Pork, Water, Seasoning, Whole Fennel Seed, Cayenne Pepper), Sugar, Olive Oil, Salt, Onions, Romano Cheese (Made From 100% Pasteurized Sheep’s Milk, Bacterial Culture, Salt, Rennet), Citric Acid, Garlic, Spices, Paprika.